Thank you for considering Irish Eyes to be your newborn photographer! I’m Felecia, the newborn photographer and my passion for newborn photography began in 2012, when my friend asked me to try to get some posed photos of her newest daughter. After the session, I was instantly hooked. I instantly began taking every newborn workshop available, and collecting any props I could. I would hit the local antique mall, constantly trying to find something I could use for my next session. Within 2 years, I had helped Erin over fill our studio with a variety of unique, and different props! We like to shop, what can I say? I continue to sharpen my skills yearly, by keeping up to date on newborn workshops and safety classes. By making newborn photography my passion, it has allowed me to stay up to date on the latest trends, and more importantly, safety training. I can not stress enough, that newborn safety is the number one priority. I will never risk your precious child in order to get a photograph. I make sure to always have an extra set of hands available to help with any posing that needs spotting. Lastly, our studio is jam packed with a large variety of newborn backdrops (125 and counting!) and props to make sure each and every newborn session is custom and original. By choosing a custom newborn photographer, I can help make sure your session meets your creative needs and personal style. So, now that you know a little bit about me, time to prepare for your session!! It is best to book with me, while you are still pregnant. This will give us time to get to know each other, and allow you to pick your color scheme for your session. Also, it is best to take these photographs in the first two weeks after the baby is born, in order to get those soft and squishy poses. Once you deliver, let me know as soon as you can, that way I can work with you on a date that best suits your needs. I usually tell parents to place me on your group text, but a personal text is great too! Like I said, we have an AMAZING studio located in Gahanna, Ohio. We do, occasionally go to your house, however, it does limit us to what we can bring. Our setup is pretty large, so hauling it out to setup elsewhere does require a small travel fee. Although, I do think you will love our studio as much we we do! Obviously, sleepy babies are the easiest to work with. There are a few steps to help with this. I like if you keep baby on his/her routine as much as possible. I will already be messing with her a bit more than she is used to, so try to keep what little routine you’ve likely established in place. Nursing moms, you probably won’t have your milk in for pumping. However, if you do, try to have a little bottle expressed for us. If not, no worries! We will just have you nurse when needed! If you’re formula feeding, bring plenty, please! Please try to avoid eating any acidic or gassy foods within 48 hours before the session….if it will make you gassy, it will most likely make baby gassy. We wouldn’t want upset tummies. Also, while pacifiers are not a must, they certainly help! You wouldn’t believe the amount of babies that come to our studio that don’t normally take a pacifier, but will for the session. It’s a great, quick way to soothe a restless baby. I personally recommend MAM or Nuk. A pacifier is a great help, and would be appreciated if you bring one. You can toss if after the session is over! Also, don’t be shocked, or offended if we ask you to sit in the lobby. It’s nothing personal, we swear! Babies can smell mom, and the closer you are to me and baby, the more he will want to snuggle and nurse. So take a seat in our comfy lobby, have a snack (I have plenty!) and binge watch your favorite shows! We’ll call you in when we need you, or are ready to family pictures! Sometimes, babies wake up during their session, or in rare cases, never sleep! If baby is content, we will keep going with the session. We will swaddle, do parent or sibling photos while the baby is awake. Also, we CAN do some poses and setups with an awake baby. Sometimes, they are the best ones! So don’t fret if she isn’t immediately asleep! I typically do parent/family photos on our wood, cream or gray background. They keep it simple, and clean for your session. I recommend you and your family wear solid colors, avoiding loud prints (plaid is ok!). I recommend Grays, blacks, blues and creams. Baby should come in a loose sleeper, that is easy to remove. He will be swaddled for family pictures, in a coordinating wrap. Also, for sibling girls, we have an amazing variety of little dresses to choose from. Mom is also welcome to check out our closet of dresses if she wishes! Well, we did it! After your newborn session is complete, we will choose a date within 2 weeks to go over your images and select what products, both digital and print, you would like. This is called a proofing session and will take place in the studio where the session was held. Your images will be uploaded to an online gallery so you can share with family and friends as well! Thank you for considering allowing me to capture your babies first session and I hope this helps you have a better idea of what to expect for the session! I can’t wait to meet your new little one! Contact us today to schedule your newborn session!! 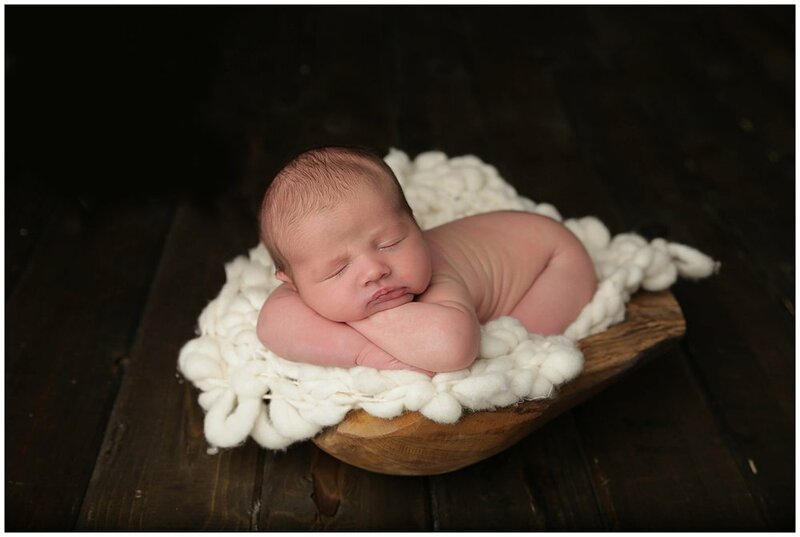 Lately, I have had a few new-ish photography friends ask about newborn posing. Most are off put, or taken back when I preach about the safety, instead of how to get that sweet little baby into the pose they desire. Safety is often the first thing overlooked by a new photographer. Often they think of props, blankets, something to pose them on, etc, but they often forget my #1 rule, which is of course, is the baby safe at all times? If you know me personally, you may know I am not exactly a risk taker. I am a huge fan of rules, bedtimes, bike helmets, child safety caps, 5 star safety ratings and full coverage auto insurance. If any of you know my husband, Randy, personally, you understand why full coverage is a must. My husband likes to joke that I am a perfect blend of Ben Stiller's character in Along Came Polly, a life insurance underwriter and risk assessment pro and Ryan Reynolds' in Chaos Theory (watch if you haven't!!). His character prides himself on never taking risks, perfecting time management and maximizing efficiency. I am 10 and 2 on the steering wheel, phone turned to "do not disturb", radio off and buckled. I blame my overly cautious ways on my mother, who cut my steak into tiny bite size pieces until I was 17. Now, imagine me at my senior prom, presented with my steak dinner and to my horror, it was in one piece. My best friend had to cut my steak for me (Thanks Mike!). Now, when I discovered newborn photography about 2 years after my oldest son was born, I knew that was my passion. I had found a copy of Sleeping Beauties by Tracy Raver and Kelley Ryden and knew that is what I wanted to do. Now mind you, in my area, newborn photography meant in hospital photos before you went home, or the awkward in store kiosk at 6 weeks old. My oldest sons newborn pictures where taken at a Kmart, and he was just on a brown blanket, and it was 2 shots and done. I noticed there wasn't much concern for his safety. Being a new mother, I wasn't sure what to say, but figured she was the pro. I began diving into any class I could take, learning about how babies move, what soothes them, what is safest and mastering photo shop. Any safety class that The Milky Way or Creative Live offered, I immediately signed up for it. I absorbed as much information as I could before I began offering newborn sessions. I studied posing and safety for almost 2 years before I even started! Now, I still photographed weddings and seniors, and that really was to fund my education and help me build an inventory for my up and coming newborn business. Babies are not props. They are people. They are your clients most precious thing in their life. They have trusted you, the professional photographer to not only capture the small window that is a newborn; they have trusted you to do it safely. When my sons were born, I would snuggle them so close to my body, I could feel their breath on my chest, and I knew they were safe. I would expect my photographer to do the same, and keep them safe. So often, I hear photographer friends say "I can't wait to try this pose, prop, etc", then become frustrated when little Baby E won't cooperate. Then they have to photograph the baby in the same chin on wrist, or bum in air pose as the last 10 newborns, but guess what? He's comfortable, he's happy and so is mama. Her son has never been photographed in that pose, and she will still love it all the same. I literally had a blue bucket for FOUR years before a baby would pose in it, but it was ok. All those babies that wouldn't pose before were safe and happy in another pose. Can you lend me a hand? While I prefer having an assistant at shoots, I can usually get by on my own. I do however, ask dad to usually lend me a hand so I can safely get the shot I want. This is usually true for prop shots, and the oh so loved, froggy pose. Shots like these are taken in a series, so that way, there is ALWAYS a hand on the baby. Usually I hold the wrists so I can get the top of the head, then dad hold the head, keeping stress off baby's neck, and I combine them in post production. Baby is safe, parents are happy and I too am happy. Now, what about the poses where they are safely wrapped in a bowl or on a flokati rug? All is good! Well.. I use a lot of organic wool, felt, or knitted props. Sometimes, these little fibers can come loose and wrap around the baby's fingers and toes. I always make sure the baby is clear of this, and comfortable. Littles like the grab and pull the rugs and bump blankets (the white blanket little Harley is on) and sometimes it can come apart and wrap around little fingers. While it's not the first thing most think of in newborn safety, it is an important one! What about babies circulation? Are all the extremities pink with good blood flow? Erin, Sonia and I are both trained in how to pose and WHY you pose a certain way. Keeping them warm, and those arms and legs pink and rosy is just as important! Bottom line, find a photographer who is about the safety of your baby. Our main focus is safety, and the rest will fall into place!